Currently browsing posts filed under "Michael Glier ’75"
First, apologies for going at this a bit backwards. Just think of it as entering a gallery from a side room, rather than the one planned by the curator. The painting I posted yesterday was from Glier’s recent work in Hawaii. He is there because it is the third part of a much larger plan, which he outlines quite beautifully on his site. Hawaii, is the antipode of his location last year, which was Botswana. I actually posted about that part of his trip back then, but since Dcat is in Botswana now (or just returned? ), and because Glier has completed paintings that were not up last year, I thought I’d post a refresher. I highly recommend you explore Glier’s site. His project is inspiring, original, and of grand breadth, and his *paintings, photographs, and writing will transport you. If you are reading this, chances are good that you are not on vacation, and that you are looking for a bit of distraction from work. If so, Glier’s project will be a meaningful one. I have been following Professor Mike Glier’s posts for a while and was quite struck with his recent work on Hawaii. You may have seen the paintings in the sidebar a while back. I think they are a breath of fresh air, or should I say, a dousing of cool water? Hope everyone is having a nice summer, even if not in Hawaii. Michael Glier ’75, is one of many Williams professors who are also practicing artists. Currently in Botswana, he is working on the third part of an ongoing project that involves painting on location in various parts of the world. 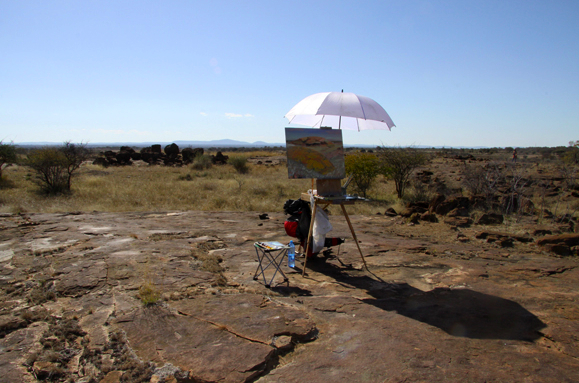 Antipodes, the project, is a road trip to paint outdoors in landscapes on opposite point of the globe. In the summer of 2009, I’ll travel to Botswana, and then in the winter of 2010, to its antipode, Hawaii. With any luck, I hope to spend the next few years visiting other antipodal landscapes to paint. The purpose, besides satisfying my curiosity and attempting to make a few memorable paintings, is both to respond to specific places and to visualize the earth. If we are to maintain the environment so that it’s fit to inhabit, we must simultaneously preserve our neighborhoods and consider the global consequences of our actions. To stretch one’s perception from the local to the global is a feat that requires imagination and empathy. It’s also a challenge that defines our time. Antipodes is an attempt to represent this challenge. Glier describes the entire project here. From his five most recent paintings in progress, to essays chronicling his travels, the site is an adventure in itself. He writes fluidly, ranging easily from memories of growing up in Kentucky, to farm life in rural Botswana, to a rather frightening encounter while plein-air painting at “Woman’s Rock”. I encourage you to share in the experiences of the talented, adventurous Professor Glier. EphBlog is powered by WordPress and delivered to you in 1.003 seconds using 33 queries..